The House Judiciary Committee voted 7-6 to table House Bill 548 after a lengthy hearing. . . .
Democrat Eliseo Alcon of Milan joined the six Republicans on the panel to stop the measure . . . The committee’s action was a blow to gun-control groups such as New Mexicans to Prevent Gun Violence and the New York-based Everytown for Gun Safety. They argued that Garcia Richard’s measure would close a loophole that allows untold numbers of people to acquire guns without background checks. 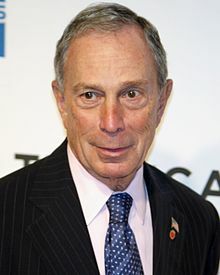 The lobbyist for Everytown, which is chaired by media mogul and former New York City Mayor Michael Bloomberg, was the biggest single campaign contributor in New Mexico last year, giving more than $219,000 to politicians and political action committees. In contrast, the National Rifle Association spent only about $10,000 on New Mexico candidates last year. . . .
New Mexico is another state where Michael Bloomberg has massively outspent the NRA in state legislative races. In New Mexico, Bloomberg outspent the NRA by 22 times.